Silverware was dished out thre local clubs over the weekend as Leighton Town U13s, U15s and Woodside U15s all picked up trophies. The U13s were 5-2 winners over Eaton Bray Lions to lift the Bedfordshire Youth Saturday League Shield. In a tense final played at Ampthill FC last week Woodside U15s became the first team from Leighton Buzzard to win a Beds League Cup, beating Brickhill 2-1. Woodside started brightly with two goals in the 1st 10 mins from top goal scorer Kelsey Wilkes. The Drama continued when Woodside gave away a penalty only for the keeper Stephen Hunt to save and keep Woodside’s dreams alive. 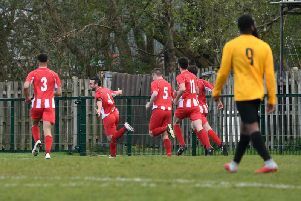 The second half saw Brickhill came back at Woodside and dominated the play which was rewarded in a goal close to full time to set up a nail biting last five minutes but Woodside defended magnificently and see the game out at 2-1 winners. Woodside manager Chris Williams said: “I have always believed in my team and the spirit and fight we showed tonight was incredible. “The lads have worked very hard preparing for this final after coming back from a post season tour in Great Yarmouth at the weekend. It was an emotional day for Leighton Town U15s as they got their hands on the Bedfordshire Youth Saturday League Shield, beating Maulden Magpies 2-1. Trailing 1-0 after 10 minutes, goals from Nathan Turney and Luke Mills won it for Leighton. A year ago, manager Chris Richmond unexpectedly died. A year on, the club hosted a tournament in Chris’ honour. This attracted nine teams, some travelling as far as Northampton. Most of the teams knew of Chris in the footballing world and wanted to pay their respects and remember him in the way Chris would have wanted. In the morning of the 10th May, the U15’s and U11’s played in seperate football tournements. Chris’s former side (Leighton Town Sunday team) won the U15’s tournament and Flitwick Eagles won the U11s. During the afternoon 40 plus men, all who knew Chris, mostly from the Friday night Vets League played at Vandyke Upper School where Chris played for many years got together and had an afternoon of chraity matches, eventually won by team name ‘Richmond United’ who were presented with a shield from Tasha Richmond at the end of the day. This event is going to be an annual event in hounor of Chris Richmond. All funds raised from this event has been split between Leighton Town U11’s and U15’s and the Heart Foundation.